The career of Jeff Bagwell was marked by a number of well-deserved awards and amazing statistics. In acknowledgment of his outstanding career, the 1991 NL Rookie of the Year and 1994 NL MVP will now be inducted into the National Baseball Hall of Fame. We are proud to honor Jeff Bagwell with the limited release of this beautiful black maple, full-size bat featuring his career stats and facsimile signature on the barrel. Each bat from this limited series of 2,017 is beautifully etched and includes the exact date of enshrinement at the National Baseball Hall of Fame in Cooperstown, NY. This hand-crafted bat is a fine piece of authentic memorabilia that every Astros fan will love to add to their own collection. Order yours before they are gone. Due to the limited release of this item we must charge your credit card for the full amount immediately upon taking your order. This policy ensures we reserve a bat for you. We will confirm your order by email. These bats are not game used. Please allow 4 to 6 weeks for delivery. 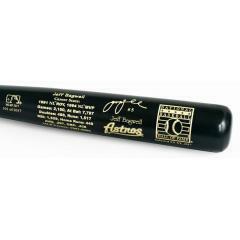 Jeff Bagwell Official Hall of Fame Comemorative Bat $129.95 Sold Out!